Midland Radio has been a show participant at the Consumer Electronics Show for several decades. Long an industry leader in two-way radio technology in CB and GMRS/FRS radios, Midland plans to launch new products in 2018 and is proud to showcase them at the biggest electronics trade show in the United States. 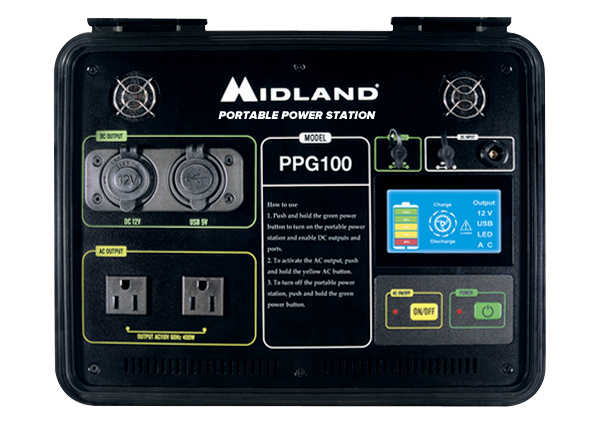 The PPG100 Portable Power Generator signals a shift into outdoor preparedness and sustainable green energy solutions. This product has already begun collecting trade show accolades and generated media buzz. The PPG100 took home “Best in Show” honors at Outdoor Retailer 2017 this summer and earned a Global Media Award at the 2017 SEMA Show in Las Vegas this fall. It has also been featured in Expedition Portal and Outside Magazine. Midland continues the expansion of its MicroMobile® product line with the MXT275. After seeing big success in 2017 with the MXT105, MXT115 and MXT400, Midland debuts the 275 with a brand new, fully integrated, handheld microphone and 15 Watts of broadcast power. The MXT275 also includes popular MicroMobile® features like NOAA Weather Radio, repeater channels, privacy codes, channel scan and more.